Anytime you combine chocolate, caramel and nuts you will get my attention. These Salted Pecan Turtles might look similar to ones you have sampled in the past, but these have an extra hit of salt, due to their formation on a salt block. We have written about working with salt blocks before here at Bakepedia. Here, Jessica Harlan covers this topic quite thoroughly in The Simple Art of Salt Block Cooking. She offers savory as well as sweet recipes and this is one of the easier ones to get you started. Playing around with a salt block can become addictive and you will begin to see the myriad of ways that yours can be used. For a savory recipe, try her Herbed Pancakes with Cured Salmon and Crème Fraiche. Excerpted with permission from The Simple Art of Salt Block Cooking by Jessica Harlan. Published by Ulysses Press, 2015. 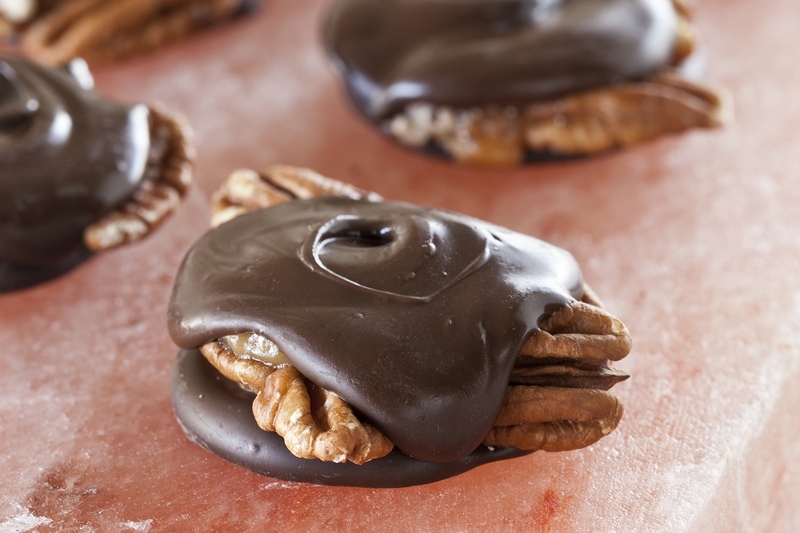 Being denizens of the South, we’re big fans of all things pecan, and these turtles remind us of the goodies from one of our favorite local candy makers. Not a fan of pecans? Walnuts, pistachios, peanuts, or almonds would all be delicious variations. Chill the salt block for several hours or overnight. In a heavy saucepan, combine the granulated sugar, brown sugar, butter, milk, cream, and corn syrup. Bring to a boil, and reduce the heat to maintain a simmer. Cook, stirring occasionally, for around 15 minutes, until the bubbles are thicker and slower to pop. You can test the caramel by dropping a little into a cup of ice water. It should form a ball that is chewy but still soft. While the caramel is cooking, melt the chocolate chips in a small saucepan or in the microwave. the salt block. Arrange the pecans in groups of two or three on top of each round of chocolate. Working quickly, before the caramel hardens, spoon about 1 tablespoon of caramel over each cluster of pecans. When the caramel sets a little, spoon a dollop of chocolate (about 1 tablespoon or less) on top of each, spreading it to cover most of the caramel. (Conversely, you can eliminate the base of chocolate and arrange the pecans in clusters directly on the salt block, spooning the caramel and chocolate over them.) Place the salt block in the refrigerator for several hours, until the chocolate hardens. The caramel can be gently rewarmed over low heat if you need to make a second batch. When the candy is set, use a metal offset spatula to remove from the salt block.